A pregnancy test is a test that can help you determine whether you are pregnant or not. These tests check for chemical markers that are associated with being pregnant. The chemical markers can be found in either blood or urine and therefore, in order to take a pregnancy test, you need to check one of these substances. There are two methods of pregnancy testing. One is through a blood test, where the level of a pregnancy hormone known as Human Chorionic Gonadotropin (HCG) is detected in the blood. You will need to visit a doctor or a medical professional, to get a blood test done. Can Pregnancy Test Be Wrong? What Is The 3 Hour GTT In Pregnancy? The other way is by checking the levels of the HCG hormone present in the urine. A urine test can be done either by a doctor or you could take the test at home, using one of the several home pregnancy test kits that are easily available at most pharmacies. However, the pregnancy test results for the blood test are known to be more accurate, than the urine test results. This could also be because the blood test can determine if you are pregnant, a lot earlier than a urine test can. There are two different types of blood tests that can be conducted for the purpose of determining pregnancies. 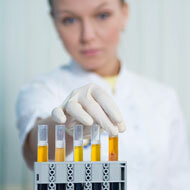 A Qualitative Blood Test checks the blood, only to determine if HCG is present or not. It is as accurate as a urine test. A Quantitative Blood Test, also known as a beta HCG test is used to measure the precise amount of HCG present in your blood. It can detect even a small amount of HCG in the blood, which is why it is the regarded as the most accurate and the best pregnancy test. Home pregnancy tests are accurate most of the time and they give you the result within a few minutes. Moreover, they are a lot cheaper than a test conducted by the doctor, especially as there are several companies offering discount coupons on them. Most of these tests work in a similar way; a sample of your urine needs to be collected and tested either by using a stick, or a special container. The amount of time that each test requires, to display the result in a “result window” may vary for different brands. On taking the test, if the second pink (or blue) line appears in the window, it indicates that you have tested positive for the pregnancy. However, at times the test may not be working properly and in such cases, the results will not be accurate. Most companies recommend that a home pregnancy test be repeated after a few days, regardless of the result.